While the improvements in Leopard (aka OS X 10.5) are many, they’re anything but cosmetic. This is nowhere more evident than in Time Machine, Leopard’s powerful automated backup feature. For some people, Time Machine has been the most hotly anticipated feature of Leopard and arguably the most compelling reason to upgrade. Time Machine’s polished user interface, with its time-travel metaphor, will instantly grab the attention of anyone who has struggled with the staid backup offerings thus far available for the Mac. With Time Machine, the ability to easily search for and retrieve previous incarnations of a file, whether it’s the version of a report from ten hours ago or the one from ten weeks ago, is an enticing demonstration of what awaits Mac users. Of course, this powerful backup engine is of little use unless you supplement your Leopard upgrade with a massive amount of new hard-drive space so that Time Machine can go full tilt at keeping your data safe. To help you with that task, we’ve reviewed seven worthy contenders for getting your Time Machine backups in gear. They represent a sampling of the largest single-drive external units available today, ranging from 750GB to 1TB in capacity, and with a mix of transfer rates and connection options, including USB-only drives, triple-port drives, and drives with quad-port capability. For this roundup, we tested the following devices: the Buffalo DriveStation TurboUSB (750GB) , the Iomega UltraMax Hard Drive (750GB) , the Maxtor OneTouch 4 Plus (750GB) , the OWC Mercury Elite-AL Pro (1TB) , the SimpleTech SimpleDrive USB 2.0 External Hard Drive (1TB) , the Western Digital My Book Studio Edition (1TB) , and the WiebeTech RTX100-SJ (1TB). Time Machine is designed to back up your boot drive, and because you’ll typically be running from the same boot drive for a few years, it’s better to start out by giving Time Machine ample room for storing the mind-numbingly large number of file revisions you and your Mac will generate during this period. Translation: the bigger the drive, the better. Although you could use a smaller-capacity portable drive for your Time Machine backups, the massive 750GB and 1TB drives available today are offered only in desktop models. And although you may be tempted to purchase a drive of lesser capacity, the drives presented here offer ample space for Time Machine to maintain a full complement of your Mac’s backed-up files without running out of space and beginning to overwrite your previous backups. That said, it’s always a good idea to gauge how much storage space your current setup uses. Remember that Time Machine can’t defy the laws of physics and compress your files into a superdense mass of data, so if you plan to use Time Machine, figure on buying a drive that’s several times larger than the amount of data you plan to include in your backups. If the 750GB and 1TB capacities we looked at in this review are not quite right for you, most vendors offer similar models in several other storage capacities—and in some instances, outfitted with more or fewer ports. OWC, for example, offers the widest range of capacities—a total of six sizes, starting at 250GB and going up to 1TB; Maxtor sells three capacities, starting at 250GB. Being desktop models, all the drives reviewed here either stand upright or lie flat on your desktop within reach of your Mac, and all use external power adapters. Although we prefer the smaller power adapters that plug directly into the wall (these ship with the Western Digital, Maxtor, and SimpleTech drives), the larger brick-style power supplies of the other drives actually fit better when plugged into a multiple-outlet strip. The three drives featuring FireWire 800—the Iomega, OWC, and Western Digital—include two FireWire 800 ports, useful for daisy-chaining a connection to multiple devices. The Maxtor is the only drive in the pack that doesn’t have a physical on/off switch—however, this is a minor issue in practice, because the drive will automatically switch into low-power mode after a short period. Still, if you’re the traditional type, you may miss this feature. The SimpleTech, the OWC, and the WeibeTech lack a hole for tethering a security cable, a possible buying consideration if you’re concerned that someone might walk off with the drive. 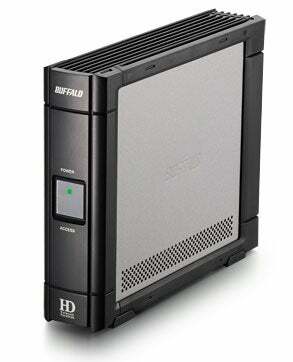 With the exception of the WiebeTech, all the drives include some form of backup utility. This may not be a selling point, however: the advent of Time Machine will likely make the bundled backup software less attractive to Leopard users. Still, the software is there if you want to use it. Plus, for the drives that include a one-click backup feature (the Maxtor and SimpleTech), this bundled software can be useful for performing backups of data that’s ill-suited to Time Machine—for example, large, single files that change frequently, such as a virtual-machine file from Parallels Desktop. However, some of the bundled software is less useful: SimpleTech ships the TotalMedia Backup from ArcSoft, a PowerPC-only OEM product. It sometimes behaved erratically on Leopard in our tests. Plus, the company doesn’t even give you a backup copy of the software on CD (it’s supplied on the drive itself). Maxtor’s bundled software, Maxtor Manager, is not currently Leopard-compatible, but a beta version is in the works. Any drive will work with Time Machine as long as it has been formatted in HFS+. When you plug in a drive, Time Machine asks if you want to use it as a backup destination. Time Machine is designed to work automatically in the background (the default setting is to back up every hour), whereas the backup-button features of these drives are intended for user-initiated backups. Time Machine doesn’t respond to button backup commands, nor would you necessarily want it to, since it’s always on, doing scheduled backups for you. For performance benchmarking, we subjected all the drives to our standard battery of tests, running each test on all the ports available on that particular drive: four drives feature an eSATA port, which is the external version of the drive’s speedy internal SATA connector; four have FireWire 400, FireWire 800, or both types of FireWire ports, and all of the models offer USB 2.0 support. This eclectic mix of hard-disk mechanisms and port speeds yielded a range of performance, with the logical conclusion that faster ports gave better results—although not always as dramatic as we would like. eSATA is the powerhouse port, and those drives with eSATA offered a truer indication of what their raw hard-disk mechanisms were capable of delivering. The differences between them ranged from a dramatic 19 percent increase (the WiebeTech versus the Iomega on the low-memory test) all the way up to a 25 percent speed boost (OWC versus Western Digital) on the file-duplication test. The file-copy test revealed fewer differences among the drives when they were connected via eSATA. Where SATA comes into its own is in a RAID (Redundant Array of Independent Disks) configuration, which uses multiple drives. But until Apple gives eSATA the official nod by including a native eSATA port on Macs, you’ll need to also shell out for a compatible PCIe, PCI, or PCI-X card (for a desktop Mac) or an ExpressCard (for a MacBook Pro, for example) to enjoy the speed gains afforded by the eSATA-equipped drives in this roundup. 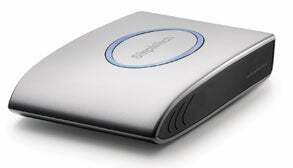 For maximum speed, you’ll want a drive with an eSATA port. Although we found eSATA performance between 4 and 13 percent faster than FireWire 800, FireWire in general is more common, and is more relevant to most users because it’s built into all Mac desktops and laptops in either 400 or 800 configurations or combinations. Even if you weren’t planning to buy an external hard drive to use with Time Machine, FireWire 400 and 800 drives are still useful for storing vast numbers of files that you don’t need every day, for scratch disk space needed to use powerful programs like Photoshop, and as an emergency boot drive. The OWC drive pulled ahead of the other two FireWire 800-equipped drives (the Western Digital and the Iomega) in all three tests, and was up to 15 percent faster than the Iomega on the file-duplication test and 8 percent faster than both the Western Digital and the Iomega drives on the file-copy test. In our tests on the USB front, the USB-only Buffalo DriveStation, featuring a supposedly speedy custom driver, did not meet performance claims that Buffalo listed on its Web site. It tied with the Maxtor in the file-duplication test; and on the low-memory test, it performed 17 percent slower than the fastest USB performer, the SimpleTech. In the file-copy test, the SimpleTech was on a par with the pricier OWC drive, and it edged out the next two fastest drives in the file-duplication and low-memory tests. 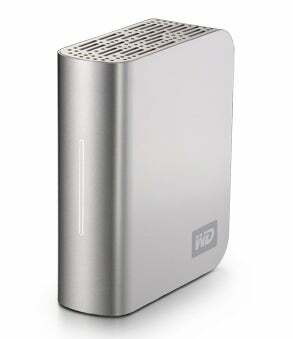 With its quad-port capability and attractive styling, the Western Digital My Book Studio Edition is our overall pick. If you have less money to spend or you don’t think you need a full terabyte of storage, check out the 750GB Iomega UltraMax. For those who don’t mind being stuck in the slow lane, the USB-only Buffalo DriveStation Hard Drive will get the job done. If the plain looks of the Buffalo don’t do it for you, you can opt for the trapezoidal Maxtor OneTouch 4 Plus with a FireWire 400 port. Although the quad-interface OWC Mercury Elite-AL Pro was the champ in many of our tests, it is also $40 more than the Western Digital drive. The SimpleTech SimpleDrive is $20 more than the Western Digital drive, and its lack of ports other than USB make it less attractive than others. And although the latching and lockable door featured on the WiebeTech RTX100-SJ is novel, the drive’s $527 price tag puts it beyond the reach of many users, with the $100 enclosure-only version perhaps more worthy of consideration as the basis for your own do-it-yourself drive.